Our Doublewinch is adapted to the original winch set therefore your gear needs no changes or modification. Do not dissemble and do not use our gears for other purposes otherwise we take no responsibility for the wear out. The gears are produced in the metric system. Use of 11mm “Dynaline” or “Plasma” synthetic rope. Use 60/70mm2 cable from the batteries to the contactors via a suitable cut off switch, otherwise the winch will not work in full power. Never put your hands in the fairlead or near the winch during operation. Do not forget to pour the transmission oil in the winch. Free spool fitting and operation: In order to disconnect the motor from the gear system you need: Turn the handle against clock arrow and pull towards yourself. The gear is disconnected from the motor. Do the same with the second handle and the motors are disconnected from the winch gears. Now you can roll out the rope easily without using the motor. Connecting the motor is being done in the same way, just oppositely – push both handles inside the body and turn them half turn along the clock arrow (the handle is fixed). The motor gear is connected with the winch gears, you can use the winch to roll in or roll out the rope. This construction is simple but at the same time reliable. In case of motor breakage, with the help of the handles you are able to disconnect any motor. Your winch will be working even with one motor. The handle fixing devise is unique because of its simplicity. At the same time it is reliable and assures that handle will not slip out from vibration as it is firmly locked. 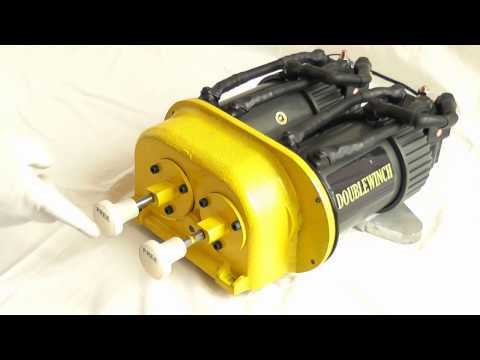 This makes sure the motor gear will not be pulled out and the motor will not be disconnected from the winch gears.